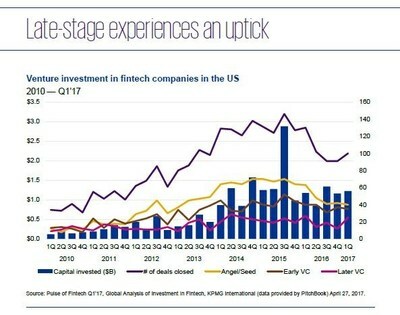 NEW YORK, April 27, 2017 /PRNewswire/ — U.S. venture capital (VC) investment in fintech companies rose to $1.2 billion in Q1’17, driven by late-stage deals, which reached the highest activity since Q1’16, according to KPMG International’s Q1 2017 The Pulse of Fintech report. Non-VC fintech investment in the U.S. reached $300 million in Q1’17, leading to a total of $1.5 billion in fintech investment in the U.S. for this quarter. 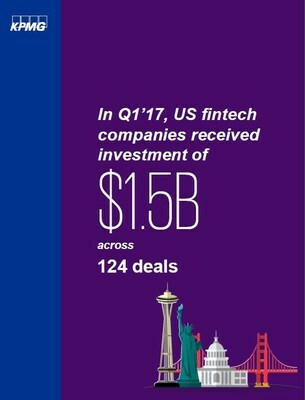 “The U.S. leads the rest of the world in the total value of fintech investment due to the large amount of funds available to invest in the market, with investors focusing on late-stage, clear front-runner fintech companies,” said Anthony Rjeily, KPMG’s U.S. Financial Services Fintech Practice Co-Leader. Despite a strong quarter in the U.S., global fintech investment got off to a soft start in Q1’17, with total global investments at $3.2 billion, down from $4.15 billion in Q4’16. Global fintech M&A dropped in Q1’17, with $920 million in deal volume, down from $1.8 billion in the previous quarter, and less than half of the $4 billion in funding in Q1’16. Global venture capital funding to fintechs held relatively steady at $2.3 billion in Q1’17. The global market is seeing an increase in the breadth of fintech technologies and applications. Robo-advisors and other hybrid advisory services continue to gain momentum in Q1’17 as financial institutions and banks recognize their value with both millennials and high net worth individuals, in providing better customer experiences and targeted services. Robo-advisory, AI and data analytics are expected to be hot investment areas in Q2’17. Private Equity (PE) firms, including those that are not technology-focused, are making inroads in the late-stage fintech arena with a robust sum of $1.2 billion in total PE deal value in Q1’17 across 11 deals. Fintech M&A is off to a slow start in Q1’17 at $200 million across 24 deals. The largest concentration of U.S. fintech investment remains on the West Coast with 67.6 percent of the total value of deals and 39 percent of the total number of deals. However, fintechs have succeeded in growing outside of Silicon Valley, with companies based in Delaware and Ohio making the top deals list. Global median VC deal size for late stage deals dropped substantially in Q1’17 to $10 million compared to the 2016 average of $15 million. Investment in regtech continued its growth trajectory with $219 million across 26 deals in Q1’17. Q1’17 insurtech activity remained on par with 2016 averages at 46 deals and $243 invested. KPMG LLP, the audit, tax and advisory firm (www.kpmg.com/us), is the independent U.S. member firm of KPMG International Cooperative (“KPMG International”). KPMG International’s independent member firms have 189,000 professionals, including more than 9,000 partners, in 152 countries. Pi Capital Advises South Korea’s Yesco on Investing $75 Million into a Merchant Cash Advance Company in the U.S.